Scott, 39, was an Air Force Colonel on his third spaceflight (he'd flown previously on Gemini 8 and Apollo 9), Worden, 39, was an Air Force major on his first spaceflight, and Irwin, 41, was an Air Force lt. colonel also on his first spaceflight. 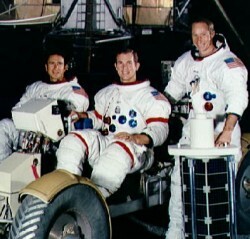 The backup crew for this mission was Richard Gordon, Vance Brand, and Harrison Schmitt. Apollo 15 was the fourth mission in which humans walked on the lunar surface. Apollo 15 launched on 26 July 1971 on a Saturn V from Pad 39A at Kennedy Space Center. On 30 July 1971 Commander David R. Scott and LM pilot James B. Irwin landed in the Hadley Rille/Apennines region of the Moon while CM pilot Alfred M. Worden continued in lunar orbit. 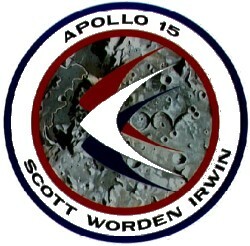 Scott and Irwin made three moonwalk EVAs totaling 18 hours, 35 minutes. During this time they covered 27.9 km, collected 76.8 kg of rock and soil samples, took photographs, and set up the ALSEP and performed other scientific experiments. This was the first mission which employed the Lunar Roving Vehicle which was used to explore regions within 5 km of the LM landing site. After the final EVA Scott performed a televised demonstration of a hammer and feather falling at the same rate in the lunar vacuum. 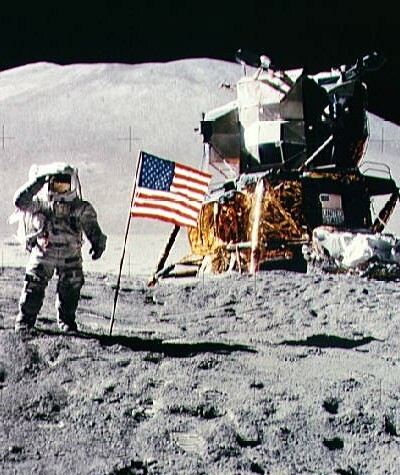 The LM took off from the Moon on 2 August and the astronauts returned to Earth on 7 August. Performance of the spacecraft, the first of the Apollo J-series missions, was excellent for most aspects of the mission. The primary mission goals of exploration of the Hadley-Appenine region, deployment of the ALSEP and other scientific experiments, collection of lunar samples, surface photography, and photography and other scientific experiments from orbit, and engineering evaluation of new Apollo equipment, particularly the rover, were achieved.